I always get excited around Thanksgiving and want to share this fail-proof technique that I have been using for over 4 years. I absolutely love this technique because 1) it is super swift and easy to prep 2) does not require the use of many pots and pans 3) doesn’t take up as much space in the fridge as traditional brining 4) people enjoy it 5) and most importantly, the turkey meat is still ridiculously moist and flavorful. After brining, you can season and dress the turkey any way you want, but below is how I traditionally do it during the holidays. Pick your turkey. You are going to love it and treat it like a baby. Wash turkey under cold water. Pat dry. Separate the skin from the flesh of the turkey and under the skin of the breasts and thighs rub salt on the flesh, focusing on the thickest part of the meat. Rub remaining kosher salt on drumsticks, wings, and a little bit on the skin. Use saran wrap and wrap up the turkey up tightly like a cocoon or a mummy. 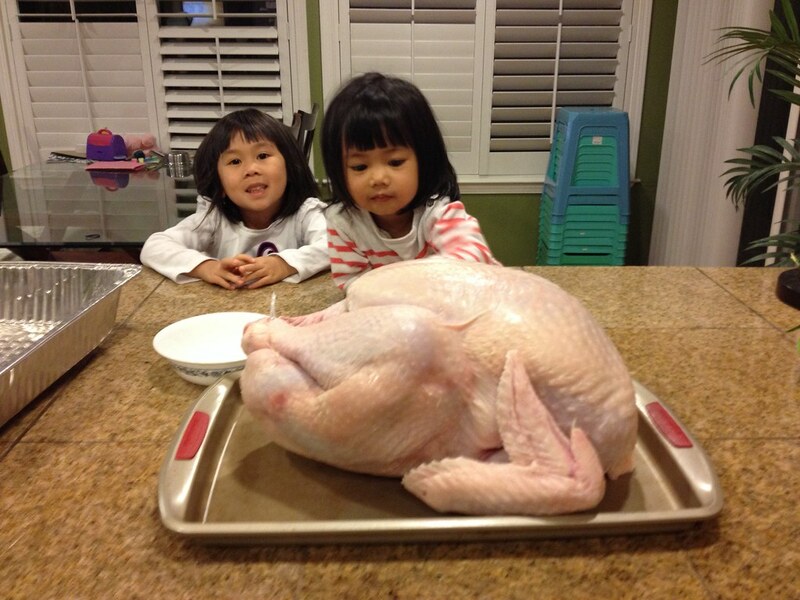 Massage the turkey every day and refrigerate for preferably three days. After three days, remove saran wrap and VOILA, brining step is complete! Pat dry the turkey, place it breast side down on a V-Rack, stuff the turkey with the chopped veggies, spread remaining chopped vegetables and 1 can of chicken broth in the roasting pan, and set the V-Rack inside the roasting pan. Brush the skin of the turkey with melted butter and sprinkle fresh herbs and additional seasonings on the turkey (if using). Roast the turkey at 425 degrees for 1 hour. Remove the turkey, lower the oven temperature to 325 degrees, flip the turkey breast-side up, baste the turkey every half hour, and continue roasting the turkey until the thigh of the turkey reaches 175 degrees. Remove the turkey from the oven, cover loosely with foil, and let it rest for at least 30 minutes before carving to allow the juices to redistribute and not drip all over the carving board.